According to a study by the University of Rochester Medical Center (URMC), sleep encourages a mechanism that removes waste products from our brain. 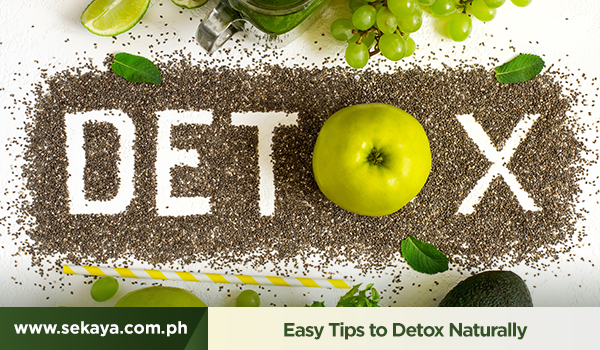 In other words, sleep gets rid of bad chemicals making it an integral part of brain detoxification. Sleep has also been connected to reduce stress and improve overall health. Just shut your room, turn off the lights, set your phone to airplane mode and close your eyes. When experiencing a difficult day, a tip is just to shut the world completely! Stay unplugged, be selfish and reserve some time for yourself. Stress weighs heavily on your mind and it’s important to blow off some steam that counts as a natural mind and body cleanse. Get lost in rewarding hobbies like painting, writing, reading, dancing, exercise, or whatever it is that brings you absolute joy. Typical diets usually encourage you to get rid of all the unhealthy stuff you can find in your pantry. However, making mindful choices about food can encourage you more to live healthy than crash dieting and depriving yourself of the food you love. Moderation is key. Also, shift your mindset and focus on the good stuff you can still eat every day. While a continuous stream of hot water sounds relaxing after being wound up all day, cold water can help your body as well. It lowers stress and improves circulation while hot water relieves tension and congestion, plus it guarantees a peaceful nights sleep. This tip could take some time getting used to, but try slowly alternating hot and cold water within 5-minute intervals. A warm cup of Sekaya Botanic Infusion’s Gentle Detox can help strengthen your body’s daily detoxification needs. It contains Burdock Root which helps the liver process toxins more quickly and Ginger Root which aids in cleansing toxin build-up in the colon and other organs. Plus, its light herbal flavor is complemented by peppermint leaf and licorice root, making it the perfect natural body cleanse partner.